The word 'religion' is mentioned in Homer's epics; it is also used by Herodotus to express the worship and the honor that a person has to offer God. Etymologically, the (Greek) word for 'religion' (θρησκεία) is derived from the ancient word that implies 'ascend' (αναβαίνω), and therefore, with the term 'religion', the ascent of man towards God is implied. But even the (Greek) word for "human" (άνθρωπος) is etymologically derived from the expression "upwards looking" (άνω θρώσκω), again implying an ascent. But, as it appears at a first glance, an ascent presupposes the acceptance of the essence of metaphysics, according to which a person's soul that has fallen from the immortal and impersonal world of ideas and is encased in a body, has to rid itself of the body [the prison of the soul] and return to the world of ideas. But even the Latin word religio – which is used to denote the word religion – signifies, according to dictionaries, the bond-unity-union of man with God; that is, it denotes the same fact of the essence and the content of metaphysics. In fact, it also presupposes – if we seek it in eastern religions – a faceless expression of mankind, since man has to disappear like a drop of water in the ocean of the Supreme Being, and thus eliminating the persona. As the late Father John Romanides had taught, the term 'religion' implies the relating of the uncreated to the created, and actually the relating of the representations of the uncreated with the notions and the words of human thought, and this kind of relating is of course the foundation of the religion and the worship of idols. Therefore, in this case, the personhood of God is lost, and so is the person's personhood; man becomes gravely ill, since his vices and his imagination are cultivated even more; and more than this, we can say that the so-called irreproachable-natural vices (hunger, thirst, etc.) become reproachable-unnatural vices; causes of social anomalies because of unlimited ambition, unjust craving for acquisition and unleashed debauchery. It is well-known that Feuerbach at first, then Marx, had said that "religion was the opium of the people". We can accept this viewpoint, that religion – as we see it in the Orient and in the religionized views of western Christianity – is the opium of the people, since it benumbs the people, it mortifies societies and leads them to such a degree of deactivation, that it becomes exploitable material for the institution of a tyranny that deprives mankind of his unalienable right to freedom. I would like to submit two characteristic examples of religious expression here below. The first example comes from the Buddhist religion. We know that according to Buddhism, that which preoccupies mankind is the problem of the pain that originates from the desire to live. Hence, the ultimate goal of the "enlightened" one is the discarding of this passion to live. The mortifying of the desire for life is achieved through a special method called Yoga with its different variations, such as Hatha Yoga (uniting with the Brahma through physical exercises), Karma Yoga (uniting with the Brahma through deeds and ritual acts), Mantra Yoga (uniting with the Brahma through chants and magic syllables), Bhakti Yoga (uniting with the Brahma through the absolute worship of one deity or the Guru himself), Jnana Yoga (uniting with the Brahma through mystical knowledge), Kundalini Yoga (uniting with the Brahma through "demonic" activities), Tantra Yoga (uniting with the Brahma through unbridled sexual acts). With these methods, man is supposed to attain absolute Nirvana, which is the extinguishing of his existence and the riddance of one' desire for life, the ultimate purpose being the avoidance of Samsara – the recycling of life, or, reincarnation. Thus, the personal Atman is united to the overall Brahma, just like a drop entering the ocean. It is obvious that in a religious life such as this, there is no personality; man is merely considered a unit, as there is also no such thing as society; no social life is encouraged, since every lifetime is considered a beginning of grief. The second example originates from the theories of Anselm of Canterbury, a scholastic theologian, who founded a Christian system that prevailed in the West, having in mind the (Frankish) feudal system of organizing society. But the feudal lord had absolute value and honor that could not be violated, because every violation of his honor and every disturbance of the feudal system that was considered a work of God, entailed the punishment of the violator; thus God is the highest form of justice, He has honor, and has instituted order within creation, therefore, the violator must either satisfy God's sense of justice or be punished. Thus, Anselm interpreted the crucifixion sacrifice of Christ, not as an expression of love for mankind, but as the atonement of justice by God the Father. This system, with the assistance of the absolute destination, led to enormous problems in the western world; problems both personal and social, as analyzed by Max Weber in his book The Protestant Ethic and the Spirit of Capitalism. These two examples, one from the orient and the other from the west, indicate how Feuerbach arrived at his motto "religion is the opium of the people". Naturally, we Orthodox also believe that if we give religion this definition, the metaphysical definition, then it can indeed become the opium of the people, because it will destroy every personal life, eliminate personal freedom, and even disintegrate social life, and turn man from a person into a unit. Christianity however appeared in the history of mankind as the end of religion, and the experience of the Church. The term "Church" is an ancient Greek term and indicates a community, the congregation of the populace – the municipality – that would solve its problems. 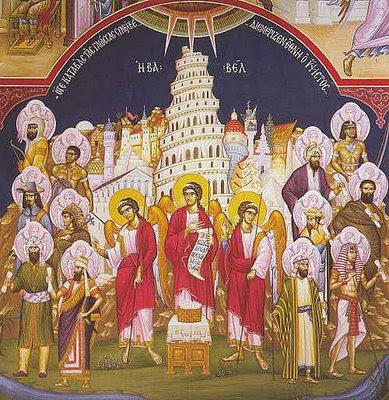 Naturally, with the term 'Church' we do not imply something external; we are implying the personal communion of mankind with God and its fellow-man, as seen in the Prophets of the Old Testament, in the Apostles of the New Testament, in the Acts of the Apostles, where "all those who believed were of one mind, and had everything common to all; they sold their lands and their belongings and shared them amongst everyone, as they had need. (Acts 2:44-45). We see it in the communities of monks, in the teaching of the major Fathers of the Church, and it extends into our time, as seen in the ecclesiastical communities narrated by Papadiamantis and the Memoirs of Makriyannis. And we know full well, from various studies, that both Papadiamantis and Makriyannis were not religious people; they were ecclesiastical, not inspired by western Puritanism, but by the hesychastic-neptic Orthodox tradition. The greatest problem of western Christianity, and many Orthodox, is that – according to Christos Yannaras – they have religionized Christianity, and transformed the Church into a religion. In this way, they cultivated fundamentalisms, hatreds, divisions, a magical perception and relationship with God, also a competitive disposition of one towards another, a self-centered view of life, a utilitarian and self-benefiting perception of society, an imaginary interpretation of everything, the sentimental approach to living and generally the opinion that the others comprise – and are - a threat to our existence. Thus, in these circumstances, the brightly-lit Christmas trees, the sentimental melodies, the moral-building analyses, all criminally conceal existential nakedness and make man a tragic being. If contemporary, speculating people looked for a meaning behind the Birth of Christ, it would be that with His Birth, Christ abolished the sickness of religion and transformed it into a living Church – with whatever its authentic meaning entails. This is the need of contemporary man who is suffering from the tragic trinity, as Victor Frankl would have said, which are: suffering, guilt and death, inasmuch as he feels his life is a pre-death experience, an existential and eternal death, and not only seeks the experience of pleasure, but perhaps through pleasure, is seeking the survival of existence. Source: Newspaper "Eleftherotypia" December 23, 2001. Translated by John Sanidopoulos.